Yes, it is 85 degrees in Cal town. Yes, winter has been over since it began. Yes, I sweated buuuuullets while eating this soup and melted on the ground afterwards and muttered incoherently, “I’m soooo hoooooot” over and over while the boyfriend rolled his eyes (And then got smart and refrigerated the leftovers to enjoy the soup cold for future meals). Yes, I’m jealous of how impeccable Adam Levine’s posture is. Wha Whaaaat? As I slouch on my couch tip typing away while watching The Voice, I wish I had another pot of this kale and artichoke soup to enjoy as a bloggy snack. As excited I am about this soup, can I just say how emotionally distraught I am about the knock out round between Sasha and Shawna? Even though Sasha is out-of-this-world talented, Shawna’s raspy earthy deep voice is bonkers amazing and I’m just going to miss that saucy momma…ugh! Team Shakira, represent! Okay. Normalcy. We. shall…take it down an octave. This soup comes together astonishingly quickly…it’s one of those recipes that at the end, you say to yourself, “that’s it?” And then you take in a spoonful and think you’ve gone to heaven. So easy, so tasty, so healthy. Give the soup a little drizzle of olive oil before serving. Perchance a garlic-infused olive oil? Citrus-infused? Get real fancy, folks! I enjoyed this soup both hot and cold. I heated it on the stove after it came out of the blender and ate the leftovers chilled for a refreshing meal-beverage. If it’s hot where you’re at, I highly suggest serving this soup chilled! Heat the oil over medium heat in a pot or Dutch oven. Sauté onion until it begins to turn translucent, about 8 to 10 minutes. Add the sweet potato and continue cooking until sweet potato is soft, stirring frequently. Add the artichoke hearts, chicken broth, cayenne, nutmeg and salt and bring to a boil. Add the kale leaves and cover the pot until kale leaves have wilted, about 1 minute. Pour the soup into a blender with the almond milk and blend until smooth. This will likely need to be done in batches. Strain the soup into the same pot you used for cooking in order to catch the strands of artichoke hearts. If serving the soup hot, pour it back into a pot and heat gently, stirring frequently until the soup is to desired temperature. 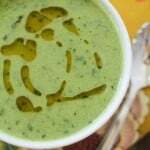 If serving chilled, pour the soup into a sealable container and refrigerate until cold. Serve with crusty bread and a drizzle of oil on top. *You can also use regular olive oil plus 4 cloves of garlic. Saute the garlic with the onion **Artichoke hearts are available fresh in many delis and they are typically marinated in oil and garlic, which is what I used. You can also use canned or frozen artichoke hearts. Love the simplicity of this recipe. And I wasn’t familiar with white sweet potatoes until now…thanks for enlightening me. BTW your smoothie recipe inspired me to order kefir (from amazon of course) yesterday. Now I will be enjoying the wide world of kefir. I could eat soup year ’round. I don’t care how hot it is! I’ve been known to whip up a pot of creamy tomato soup when it’s 110 out! I love this soup!! Kale and artichokes sound so good together! I am so jealous of you 85 degree weather. Here in CO is low clous and snow. It is so depressing!! This soup looks amazing! It’s getting kind of hot here, too, but I will eat soup pretty much all year round. Especially when it’s full of veggies! My hometown has an olive oil and vinegar store– I’m so happy to know they’re called infused oils. Now I can stop calling them fancy olive oils…. Kale and artichokes and garlic-infused olive oil, OH YES. 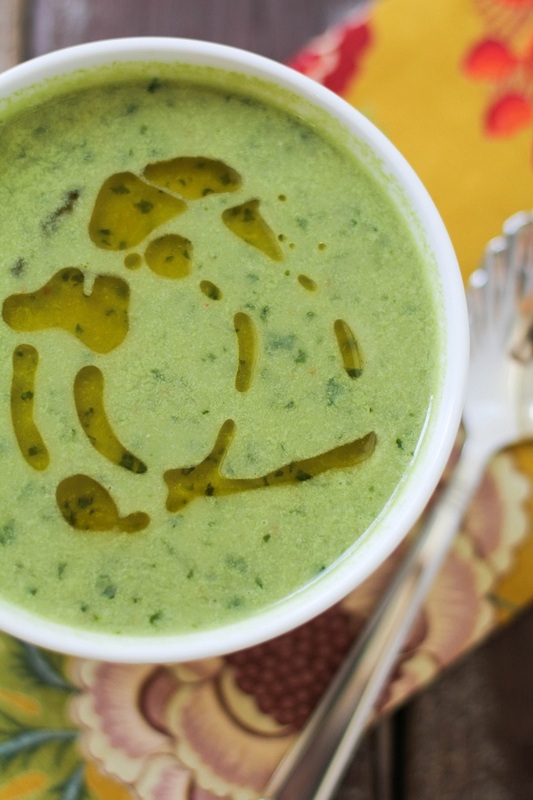 Nutritious and tasty…I feel healthier just looking at this soup! 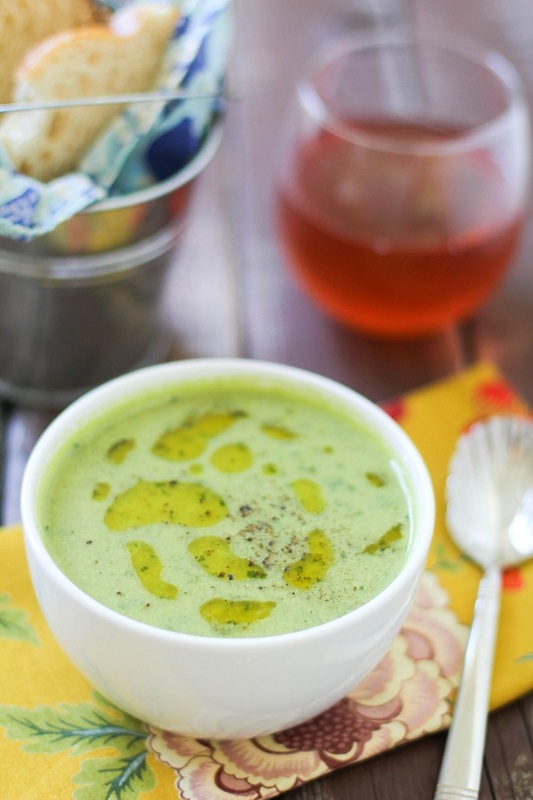 The soup sounds divine and so perfect for the artichoke season. Give me a grilled cheese sandwich and I’ll have a bowl of soup with it any time of year. I love this pretty green! Yum. I wanna dunk some crusty bread in that sucker. Yes! I didn’t even think about grilled cheese and that sounds marvelous! This is definitely a dunker type of soup! Healthy and Pretty! We’ve had nothing but cool and rainy weather here in GA mountains, definitely taking soup season on into the Spring. This is perfect! This looks so delicious,and yes I too make my family eat soup year round! I love the pretty color. I agree grilled cheese is definitely being served with this. Pinning. Ok, boom. Skip kale salad, but I CAN DO this!!!! Trying to use up some kale, and now I see a beet CHOCOLATE shake to note too??!! BOOM again! 2 birds with one stone! Thanks girl! Love the way the soup looks..lovely colour! Looking at your collection of Kale recipes, I feel I have to give it a try! This looks delicious! I was just searching for Kale and Artichoke recipes. I’ve never heard of a white sweet potato! I assume that is something you would have to find at a farmers market, as I’ve never seen them in my regular grocery store. Does it taste like a sweet potato or more like a regular potato but with better vitamins? I guess I can google it! Either way, I hope to be making this soup soon! Hey Alexis, white sweet potatoes are actually called jewel yams, but I call them “white sweet potatoes” for no particular reason 😉 They are definitely sweet, similar to an orange sweet potato, although they’re slightly more starchy. Hope you love the recipe! Sounds awesome, but could I use regular milk instead of almond milk? Thank you for the lovely recipe! I just made this tonight although it was about 80 degrees here in sunny Santa Barbara. My husband has a cold, so it was nice to have a new recipe in which to use some homemade chicken broth (and kale from the garden as a bonus)! It was delicious! reach out among the targeted audience. Because lighter ink was screened twice on the garment. Is this supposed to be 1/2 of a white sweet potato? Red and sweet potatoes vary in size GREATLY. Hi Teresa, My apologies for the confusion! I changed recipe plugins last year and some of the ingredients in some of my recipes got transposed, which is why the potato ingredient looked odd. It should be about 1 cup of chopped white sweet potato or red potato. Hope this helps, and hope you enjoy!